HeartMath UK is dedicated to improving your health, performance and well-being at home and in the workplace. HeartMath® is a scientifically validated system of techniques and technologies that help you transform your stress, boost your resilience and empower higher performance. It’s easy to learn and the simple but powerful techniques can be used “in the moment”. Our innovative emWave® and Inner BalanceTM feedback technologies give you real-time insights into your emotional, mental and physical state and help you develop the ability to self-regulate. The Institute of HeartMath’s research has shown that generating sustained positive emotions facilitates a body-wide shift to a specific, scientifically measurable state. This state is termed psychophysiological coherence, because it is characterised by increased order and harmony in both our psychological (mental and emotional) and physiological (bodily) processes. Psychophysiological coherence is the state of optimal function. Research shows when we activate this state, our physiological systems function more efficiently, we experience greater emotional stability, and we also have increased mental clarity and improved cognitive function. Simply stated, our body and brain work better, we feel better, and we perform better. 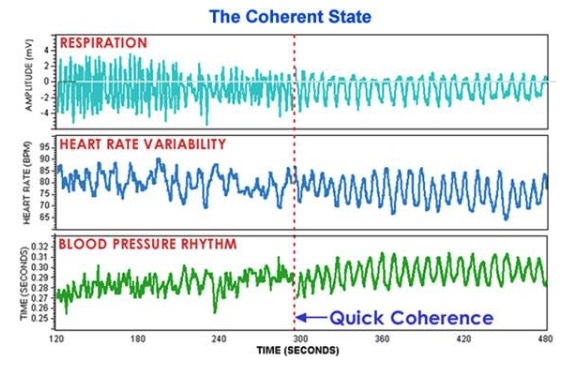 Physiologically, the coherence state is marked by the development of a smooth, sine-wave like pattern in the heart-rate variability (HRV) trace. This characteristic pattern, called heart rhythm coherence, is the primary indicator of the psychophysiological coherence state, and is what the emWave® and Inner BalanceTM technologies measures and quantify. A number of important physiological changes occur during coherence. The two branches of the Autonomic Nervous System (ANS) synchronise with one another, and there is an overall shift in autonomic balance towards increased parasympathetic activity. There is also increased physiological entrainment – a number of different bodily systems synchronise to the rhythm generated by the heart (see image below). Finally, there is increased synchronisation between the activity of the heart and brain. Coherence is not relaxation. An important point is that the state of coherence is both psychologically and physiologically distinct from the state achieved through most techniques for relaxation. At the physiological level, relaxation is characterised by an overall reduction in autonomic outflow (resulting in lower HRV) and a shift in ANS balance towards increased parasympathetic activity. Coherence is also associated with a relative increase in parasympathetic activity, thus encompassing a key element of the relaxation response, but is physiologically distinct from relaxation in that the system oscillates at its natural resonant frequency and there is increased harmony and synchronisation in nervous system and heart-brain dynamics. This important difference between the two states is reflected most clearly in their respective HRV power spectra (see image below). Furthermore, unlike relaxation, the coherence state does not necessarily involve a lowering of heart rate, or a change in the amount of HRV, but rather is primarily marked by a change in the heart rhythm pattern. While HeartMath techniques incorporate a breathing element, paced breathing is not the primary focus and should therefore not be thought of simply as breathing exercises. 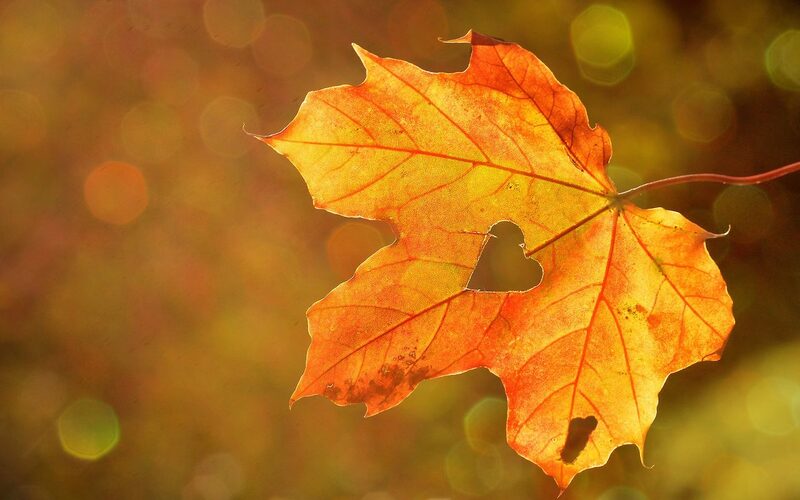 The main difference between the HeartMath tools and most commonly practiced breathing techniques is that the HeartMath tools focus on the intentional generation of a heartfelt positive state. 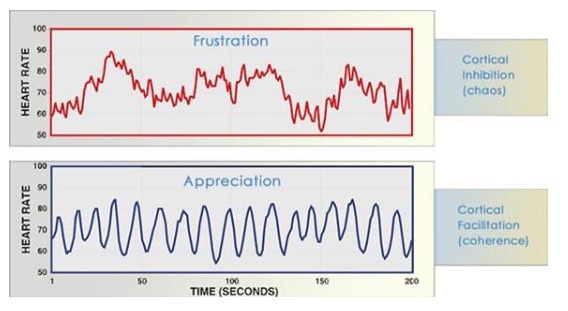 The emotional shift is a key element of the techniques’ effectiveness. Positive emotions appear to excite the system at its natural resonant frequency and thus enable coherence to emerge and to be maintained naturally, without conscious mental focus on one’s breathing rhythm. Most of us have been taught in that the heart is constantly responding to “orders” sent by the brain in the form of neural signals. However, it is not commonly known that the heart actually sends more signals to the brain than the brain sends to the heart through the vagus nerve. Moreover, these heart signals have a significant effect on brain function – influencing emotional processing as well as higher cognitive faculties such as attention, perception, memory, and problem-solving. In other words, not only does the heart respond to the brain, but the brain continuously responds to the heart. These effects of heart activity on brain function have been researched extensively and independently over about the past 40 years. HeartMath research has demonstrated that different patterns of heart activity (which accompany different emotional states) have distinct effects on cognitive and emotional function. During stress and negative emotions, when the heart rhythm pattern is erratic and disordered, the corresponding pattern of neural signals traveling from the heart to the brain inhibits higher cognitive functions. This limits our ability to think clearly, remember, learn, reason, and make effective decisions. The heart’s input to the brain during stressful or negative emotions also has a profound effect on the brain’s emotional processes – actually serving to reinforce the emotional experience of stress. In contrast, the more ordered and stable the pattern of the heart’s input to the brain during positive emotional states has the opposite effect – it facilitates cognitive function and reinforces positive feelings and emotional stability. This means that learning to generate increased heart rhythm coherence, by sustaining positive emotions, not only benefits the entire body, but also profoundly affects how we perceive, think, feel and perform. What is HRV and Why is it Important? Heart-Rate Variability or HRV is the beat to beat changes in your heart rate, and is due to the synergistic action of the two branches of the Autonomic Nervous System (ANS) – the part of the nervous system that regulates most of the body’s internal functions. The sympathetic nerves act to accelerate heart rate, while the parasympathetic (vagus) nerves slow it down. The sympathetic and parasympathetic branches of the ANS are continually interacting to maintain cardiovascular activity in its optimal range and to permit appropriate reactions to changing internal and external conditions. HRV is also a marker of biological aging. Our heart rate variability is greatest when we are young, and as we age the range of variation in our resting heart rate becomes smaller. By reducing stress-induced wear and tear on the nervous system and facilitating the body’s natural regenerative processes, regular practice of HeartMath coherence-building techniques can help restore low HRV to healthy values. The analysis of HRV therefore serves as a dynamic window into the function and balance of the Autonomic Nervous System. Call me today for a friendly chat and I’d be happy to answer any questions you may have and offer advice on how HeartMath sessions could help with you. Tel: 01903 600 848 or see my contact page for further ways to get in touch.